Elbasan is located about 50 kilometres from Tirana, in central Albania. The closer I get, the more autumn colours saturate the landscape, and the capital behind me is shrouded in mist that thickens at the foot of the mountains. I am going to Elbasan for the first time, but I already know the skyline of its metallurgical complex – it stands out in the landscape, and you can often see it during take-off or landing to and from the airport Mother Teresa in Tirana. The city seems to have been transported back in time – the battered streets are covered with asphalt dust, some men sit silently on the porch of a shack where they sell machine tools. Tanned workers carry multi-coloured metal blocks, almost abstract installations of contemporary art. The atmosphere has something that reminds me of some educational, boring Albanian films of the 80s. But then, in the industrial zone, the set shifts abruptly into a film by Tarkovsky – industrial archaeology invaded by wild plants, rarefied atmosphere, nature rapidly invading urban environments abandoned by humans. Contrary to what it may seem, this isn't no man's land, as I am informed by a grumpy man who does not seem to be a worker. He asks to see my journalist card, then, in a calmer tone, tries to understand my intentions. I already know how it feels to be a journalist in Albania – unwanted, but also feared and respected. "The pollution history is old, outdated, if this is why you are here", he says without waiting for my questions. He explains that he is responsible for one of the companies that emerged after the collapse of the regime in the industrial area. "The pollution was caused at the time of communism, now we recycle and dispose of waste with the latest technology, go ask in town how the situation has changed". And off he goes, with his car, leaving me wrapped in clouds of dust. It all started when the Communist regime set out to transform the Albanian people from peasants into proletarians. Those were the days of the great friendship with China and of import industrialization. In the 60s and 70s, thanks to the Chinese, the Metalurgjiku was built – the Albanians' pride and joy, which processed the heavy metals that supplied the whole Albanian industry. Then came a large cement factory at the end of the '60s, nickel in 1981, and ferrochrome in 1988. Elbasan, already a major urban centre of this part of the world from ancient up to post-Ottoman times, became the destination of technicians from all corners of the country. "When the Metalurgjiku was built, there was no great awareness on pollution. Only in the decades after were plants in the rest of the world equipped with filters to dispose of harmful substances", explains Albert, a former worker in the industrial complex, who reinvented himself as a cameraman at weddings after the collapse of the regime. Filters were never applied in Elbasan. It was the time of isolation, Albania against all else, faithful to Stalin and forced to get by on the Soviet and Chinese technology it already had. These were squeezed and exploited until the collapse of the regime, when large factories stopped working. Elbasan had become a heavily polluted city. Diseases, cancer, genetic mutations, and intoxicated air have often made the headlines in Albanian media since the early 90s. "Three-legged calves, goats with two heads, malformed babies – it is our abnormal normality", says Albert. 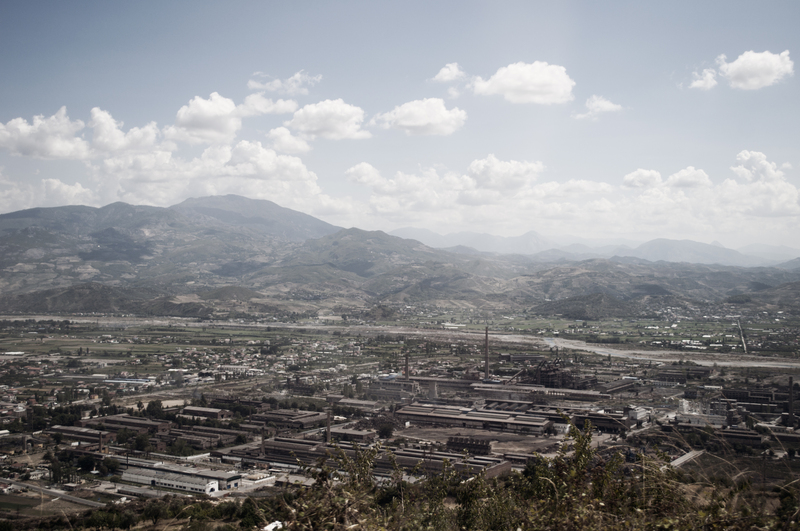 The communist legacy is heavy and toxic – not only in the city of Elbasan, but also in the surrounding area. An iron and nickel company operated in Librazhd (a town of 10,000 inhabitants in the region of Elbasan), a mineral one in nearby Prrenjas, and a battery storage in Gramsh. "The 12th sector of Metalurgjiku produced iron concentrate. In 12 years, 6 million tons of iron and nickel were worked, 25% of them discharged in the air", said a UNDP (United Nations Development Programme) report in 2003. And then there are the 2.6 million tons released into the air from Elbasan's coal thermal plant over 24 years of activity, and the 2 million tons of heavy metal waste in the river Shkumbin. To date, there has never been any intervention. "A study conducted in 1996 showed that the soil around these plants is contaminated from 30 to 50 centimetres deep, which is where agricultural products are grown, so they are contaminated too", explains an Albanian engineer engaged in activities of research on pollution in the region of Elbasan, who requested anonymity. "To restore this land is very expensive and it has never been done. There was a project which should have been implemented in 2005-2006, but stopped for lack of funding. Much of the polluted land is under the jurisdiction of individual municipalities, which do not have the means to ensure these interventions. In fact, a comprehensive study of pollution in Elbasan has never been done. To date, we cannot even tell how much polluted the city is". But the causes of pollution in Elbasan are not attributable solely to the communist past, and the fact that the Metalurgjiku is now all abandoned has not put an end to pollution. The privatization process brought various companies into the area, like the ECM cement plant, now of Libyan ownership, and Darfo Albania, bought by Austrian DECOMETAL and Russian Terwingo in 2007. The most emblematic story, however, is certainly that of Turkish Kurum. This is the leading company in the field of metal recycling, active in Albania since 1999. Since 2007, it has been the subject of increasingly structured complaints by citizens and authorities of Elbasan. Prefect Shefqet Delialliasi, commenting on the impact Kurum has on the city of Elbasan, spoke of "persisting black clouds of smoke over the city forever". According to local authorities, pollution was caused by the fact that the company had avoided investing in the necessary facilities for the disposal of the side effects of the recycling process. Local authorities thus entered in conflict with Kurum and the Environment Ministry, in charge of permits and monitoring of companies with environmental impact. And, as is unfortunately rarely the case in this part of the world, the protests were successful. In 2008, Kurum proceeded to provide the facilities required. All resolved? Not at all. Elbasan remains shrouded by greyish clouds of smoke. I ask some people down-town if the situation has changed from 2008 onwards. A doctor behind the counter of his veterinary pharmacy smiles, refuses to answer, and asks me why I asked just him. I get the same reaction by some elderly people who are reading a thick stack of newspapers and magazines in a café. Frustration and suspicion, a mix that often characterizes Albanians when it comes to denounce the misdeeds of politicians and businessmen. "Nothing has changed, now the filters are there but the company wants to save and activates them only occasionally, for a half day. But I am no one. Why do you ask me? ", finally says one of them. A technician employed by the body that is responsible for the privatization of Metalurgjiku, who asked to remain anonymous, agrees: "The filters are there now, the authorities cannot say anything, but they use them for a limited time. So in the morning the air in the city is acceptable, but then it becomes polluted as before". After the installation of filters by Kurum, the regional environmental agency, an agency under the Ministry of Environment, published findings saying that Elbasan has the same unproblematic environmental situation as, for example, Durres. However, mayor Qazim Sejdini has objected to such data on several occasions. "In this city, hospital statistics report that nearly two people die every day, of which only one of natural causes. In 2011 alone, there were 200 new cases of cancer. You cannot turn a blind eye to these facts". I speak with Sazan Guri, one of the most consistent and active environmentalists in Albania, and head of a centre for environmental studies. Accusing the regional environmental agency of having falsified the data, he says: "Air pollution in Elbasan is 440 mg/m3, 5 times the threshold of tolerance in the Albanian legislation, and 10 times higher than the threshold tolerance in the European Union. The situation is worrying. In Elbasan, 250 people die of cancer each year, an incidence ten times greater than in a non polluted city like Permet". Like the mayor, environmentalists accuse the Ministry of Environment of indifference and too much tolerance. "These polluting plants are built without any environmental impact study, the Ministry does not have in-depth analysis on these areas", says Xhemal Mato, an environmentalist in Tirana. In recent years Elbasan, like the rest of Albania, has had to deal not only with local pollution, but also with what environmentalists call "imported pollution", because of the waste imported from abroad for the recycling process in private companies. Kurum representatives declared to Albanian media that only 10% of the material they recycle comes from the Albanian territory. Waste import is one of the grey areas not monitored by the authorities. Lavdosh Ferruni, head of an environmental movement that fights for the monitoring of imported waste, mentions another aspect of no small importance: "In Albania there are no facilities to check the imported waste. Many of the metals imported contain mercury and radioactive materials which are not isolated prior to recycling. This adds to the pollution that comes from the processing itself. But our authorities pretend they do not know". Sazan Guri concludes: "At Metalurgjiku 400 jobs were created at the price of importing waste and pollution, while the recycled material is sold abroad by the private companies". Between the communist past, today's savage capitalism and irresponsible management, Metalurgjiku seems to be a metaphor for contemporary Albania. The only positive news is the emergence of the environmental movement, hopefully less sporadic and resigned than in the past.